The accounts comprise of accounts and balances that describe the use volumes of natural resources, the loading caused by the use of natural resources, and the economy and business activity of envi-ronmental protection. The accounts are formed of statistics compiled in the framework of national accounts in compliance with their key characteristics, such as the industrial classification and the classification of sectors and the domicile principle of economic units. The economy is dependent on biological and mineral natural resources and on energy sources in the environment. Their sustainable and economical use is necessary. Access to renewable natural re-sources becomes scarcer at the same time as their global consumption grows. The economy also needs the environment as a receiver like a sink, filter, decomposer and binder to manage waste and emissions into air and water, for example. The problems caused by emissions vary from individual and local health risks to disturbances to the whole planet like climate change. For these reasons, a uniform and coherent statistical description of the interaction between the econ-omy and environment is essential for defining the sustainability of communities. The integrated System of Environmental-Economic Accounting SEEA is an accounting system created as a result of the work of international organisations and communities (the UN, European Commission, IMF, OECD, World Bank). It describes with uniform contents, concepts and classifications the interaction between the environment and economy and defines for it a sustainable level both nationally and globally. 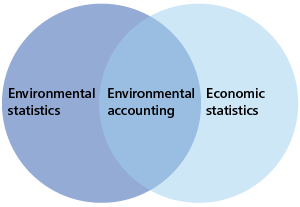 Environmental accounts require wide-ranging and long-lasting work from the statistical authorities of national and international bodies. The core of the revised SEEA was approved by the UN Statistical Commission in March 2012. The SEEA forms the statistical standard for environmental accounts.. The European Union issued a Regulation on European environmental economic accounts (EU 691/2011) (PDF) in July 2011. The preamble of the Regulation highlights the need for such high-quality statistics, accounts and reliable information where the aspects relating to the economy and environment are combined. Environmental accounts produce significant added value beside national accounts.